What exactly is property based testing? Often when you have some function, their behavior has certain properties, which are kind of like rules the function’s output always follows. For example, what if we have a function which calculates some basic geometric properties, such as the area of a rectangle based on its width and height? Traditionally, we might approach testing this kind of a function by hardcoding a number of width/height pairs and the expected result values. But there’s always a possibility our values wouldn’t include all possible cases. For example, what if one of the values is a float? Or one of the values is negative? Or both? Computers are much better at generating lots of different values. What if we just told it what kinds of inputs our function accepts and give it some way of verifying the output? Here we have three examples of how we can verify the test result for any given input without having to know the inputs up front. All of these should always hold true for any given valid input. //this function is used to test the "property"
This is just a pseudo-code style sample to give you an idea of how this type of test would work, but it looks pretty easy, right? Now that we’ve got an idea of how property based testing works, let’s take a look at how to put it into use with node-quickcheck. In the earlier code sample the test wasn’t very useful. We would need to run it a hundred times to even get enough random numbers. That’s why we’ve got tools like quickcheck, which we can use to run a hundred tests for us completely automatically. Quickcheck will even help us generate values and verify the test results more easily. Let’s start by writing the example test into something that actually works. Below, you can see a CodePen with our example modified for node-quickcheck. See the Pen kkopZZ by Jani Hartikainen (@jhartikainen) on CodePen. First, I’ve defined the rectangle area function. Yeah, it’s really basic – you definitely can test much more complex functionality with quickcheck, but let’s keep things simple for now. You can ignore the mocha.setup and mocha.run lines around the code – they’re simply used to enable us to run the Mocha test suite. You can also write this as a Node.js based test if you so feel like, and run it using mocha from the terminal. Then, we’ve got a test. It should calculate correct result for any given width and height. Within the test we first have a function called areaIsMultiple. This function takes two parameters and returns true when rectangleArea‘s result is correct for those two parameters. And now comes the tricky part. We use qc.forAll to run the actual test. It’s kind of like saying “X should be true for all cases of Y” – or in this instance, we’re saying “area is multiple should be true for all cases when given two arbitrary doubles as parameters”. Finally, we use should(result).be.true() to validate that our forAll check was successful. You can try and see what happens if you change areaIsMultiple to do something else. You’ll get an error which has an array such as [ 123, 653 ]. This means that the call areaIsMultiple(123, 653) returned false. Isn’t running the test 100 times going to slow them down? – Possibly. However, in most cases with property based tests, you test functions where it won’t be a problem. Typically, tests that are complex are slow. Using many other functions, stubs and mocks, etc. also slow tests down. Typically you won’t be using those much in property based tests. The rectangle area calculation is fairly trivial. Why don’t we look at something more interesting – and more relevant to web development. 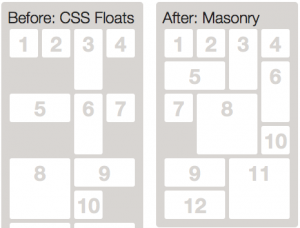 You might’ve heard of a jQuery plugin called Masonry. It essentially lays out different sized boxes into a layout which resembles a set of bricks laid out by a mason. What kind of properties would this kind of layout algorithm have? These are just two ideas, but we can use these to explode how you could approach testing this with property based tools. Let’s say we have a function calculateMasonryLayout, which takes an array of items as its parameter, and returns an array of coordinates and dimensions of how the contents should be laid out. Given a list of items with a width and a height, we can pass it into the function and it’ll give us a new list with x and y coordinates in exchange. There’s a lot of moving parts in this. Let’s see if we can fit this into node-quickcheck. We had two properties for this – let’s implement a test for none of the contents should overlap with each other, since it’s a lot more interesting than the one about container overflow. The first thing we need is a way to generate valid parameters for the function. The first parameter is an array of items. All of the items have a width and height, which can be some non-negative whole number – in other words, an unsigned int. The array can be of any length, it doesn’t matter for the layout algorithm. The second parameter – container width – can also be some non-negative integer number. How could these values be generated in code? Here we have two functions to generate values for us. First, arbUnsignedInt generates an unsigned int. Second, itemArray generates a random length array of items with random dimensions. We can use these functions to produce valid inputs for the calculateMasonryLayout function. Next, we need a function that can validate the result of the test. Since each of the result items define the coordinates and dimensions of a rectangle, we need some way of checking that none of the rectangles overlap with each other. The noIntersection function is used to determine whether two rectangles intersect. We use it in layoutHasNoOverlap as a helper to determine just that. layoutHasNoOverlap runs the masonry layout algorithm and then compares the result, checking for rectangle intersection. The way I’m doing the comparison here might not be the most efficient way of doing it because it does a lot of looping, but it should suffice for this example. What is the range of valid inputs for this function? How to validate the result? Solving these questions wasn’t too tricky. We just wrote some reasonably straightforward functions, which then plug into node-quickcheck. Property based testing can be a useful tool in the testing arsenal. It isn’t suitable for testing all kinds of functions, but it’s great when you can verify a function’s result using some kind of calculation or condition. If you want to sound very fancy, you can say property based testing is great for testing function invariants. The biggest challenge when it comes to this type of testing is thinking of good properties to test. There are many possible candidates – I listed some examples in the article for the functions we looked at, but you could probably think of some others as well. You can learn more about node-quickcheck from the project’s GitHub page. Admittedly their documentation isn’t that great, but the library is fairly simple to use. Grab my FREE 26 page Sinon.js guide!